The train will start from New Delhi station at 6 AM and is expected to reach Varanasi at 2 PM. The return journey will commence at 2.30 PM from Varanasi and reach the national capital at 10.30 PM on the same day. 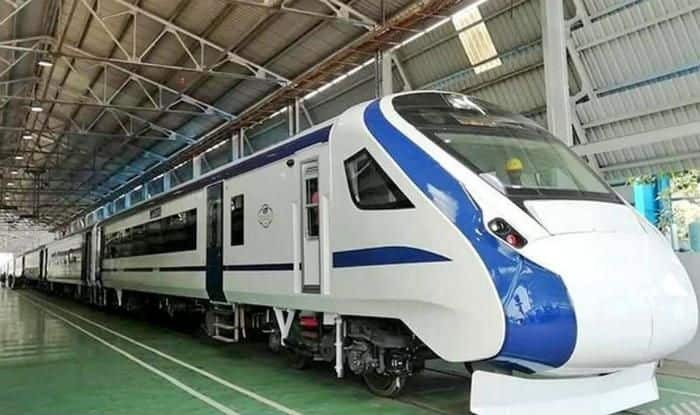 New Delhi: Union Railway Minister Piyush Goyal announced the arrival of India’s first engine-less semi-high speed train – Train 18 – that has officially become the fastest train in India. Cruising at speed of 180 kilometres per hour during a trial run, the train is one of its kind. According to sources, the train will be flagged off by Prime Minister Narendra Modi on December 29 from his constituency Varanasi. The train will start from New Delhi station at 6 AM and is expected to reach Varanasi at 2 PM. The return journey will commence at 2.30 PM from Varanasi and reach the national capital at 10.30 PM on the same day. As per reports, T18 is likely to have a fare structure similar to TEJAS. It may not have the flexi-fare mechanism will not be applicable on T18. The T18 fares will be 20-25 per cent higher than fares of Shatabdi. Passengers will be given two options for fares –one with the meal and one without the meal. At least 16 chair-car type coaches out of which two will be executive chair cars and 14 non-executive chair cars will be present in the fully air-conditioned train. The executive chair can seat 56 passengers, while the non-executive chairs will be able to accommodate 78 passengers. Apart from being air-conditioned, the train has a swanky interior and boasts of world-class facility and a host of passenger-friendly amenities which include inter-connected fully sealed gangways, automatic doors with retractable footsteps, onboard Wi-Fi and infotainment, GPS-based passenger information system, modular toilets with bio-vacuum systems, halogen-free rubber-on-rubber flooring, rotational seats which can be aligned in the direction of travel (available only in the executive class), roller blinds and diffused LED lighting, and disabled-friendly toilets.